Known as the Nation's Oldest City, St. Augustine has a rich history that spans nearly 450 years. From charming cobblestone streets to ghosts and gravestones to walking high above some of the world's largest alligators, there is a bit of something for everyone. Here are just some of the must-see tours and attractions that St. Augustine has to offer. Board the Trolley of the Doomed and explore the spooky side of St. Augustine with your very own ghost guide as you relive the haunted tales and legends found only in historic St. Augustine. Nothing will get you in the holiday spirit quite like hot apple cider, homemade cookies, caroling and a million tiny, twinkling white lights. Join fellow revelers as you tour the historic district with your complimentary magical viewing glasses amidst a festive trolley tour. One of the most extensive tour packages available, the Gilded Age Package features a three-day Old Town Trolley Pass with admission to Flagler's Legacy Tour, Villa Zorayda Museum, the Old Jail, Oldest Store Museum Experience, Lightner Museum and the St. Augustine History Museum. The perfect experience for any shutterbug or history buff. This one-hour tour features 23 stops and more than 100 points of interest in the Old City. Climb aboard as knowledgeable conductors share the history of St. Augustine from the Fountain of Youth and Lightner Museum to Flagler College and historic St. George Street. Founded in 1893, the alligator farm has entertained millions of visitors for well over a century. From rare albino alligators and native swamp exhibits to Maximo, a 1,250-pound crocodile, there is never a dull moment to be had. Check out the park's thrilling new zip line attraction, Crocodile Crossing, with two challenging courses across seven acres. Encompassing 15 acres of beautiful waterfront property, the Fountain of Youth Archaeological Park is the original site of the Nation's Oldest City. It's also considered Florida's oldest attraction. Spend hours at the Park touring historically accurate Timucuan structures, lush gardens and living history exhibits with professional reinactors. Step back in time as you catch a glimpse into 19th century daily life in what was once the opulent Alcazar Hotel where you will find hundreds of relics of America's Gilded Age including costumes, furnishings, instruments and even the stained glass work of Louis Comfort Tiffany. A combination of historical displays and private collections, it only makes sense that the Nation's Oldest City would feature a history museum. Visit the Spanish sunken treasure room and a Florida Cracker trading post as you hear fascinating stories about the Native Americans, Spanish Galleons and pirates of the Revolutionary War. 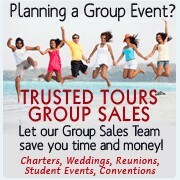 Visit the Trusted Tours online store for discount tickets on the best St. Augustine tours and attractions. The Old Town Trolley Tour of St. Augustine shows you the history, attractions and sights of St. Augustine Florida. See the Fountain of Youth, Fort Castillo de San Marcos, the Lightner Museum and more with 22 stops over a 3 day period. The Old Town Trolley Tour of St. Augustine shows you the history, attractions and sights of St. Augustine Florida. See the Fountain of Youth, Fort Castillo de San Marcos, the Lightner Museum and more with 22 stops for 2 consecutive days. Join the Ghosts and Gravestones Tour of St. Augustine for a haunting experience on this city's "Frightseeing" Tour. Included is a visit to the town's most haunted building, The Old Jail. Explore the darker side of the Nation's Oldest City, if you dare! Day and Night, Old Town Trolley has you covered in this combo package. You get a 90 minute tour of the Oldest City in America by day and a haunting experience on the Ghost and Gravestone tour at night. Also included is admission to the Old Jail, the History Museum & the Oldest Store Museum. This package gives you a combination of the best attractions of St. Augustine. Hop on & off at 20 Trolley stops. Includes admission to the Old Jail, Oldest Store Museum Experience. St. Augustine History Museum and Fountain of Youth. Experience the best of St Augustine with Old Town Trolley Tours and ride the Trolley for 2 consecutive days. This package also includes the Old Jail, Oldest Store Museum Experience, the St. Augustine History Museum and the Alligator Farm- super savings combo package! ZIPStream’s Castaway Canopy Adventure (ZCCA) is a fully guided Zip Line Eco Canopy Tour lead by professionally trained and certified guides! Come enjoy a bird’s-eye-view of the beautiful St. Augustine Aquarium grounds and an aerial trip through a corner of Wild Florida. Commissioned by railroad tycoon, Henry Flagler to resemble a luxury hotel, the Old Jail served for over 60 years and is among one of the only surviving 19th century jails. Discover the latest and the best Time Saving Miracles from the Turn of the Century in St. Augustine's Oldest Store Museum Experience. It isn't simply a museum, it is an interactive experience with actors portraying characters you would have met in the 1908 store, with over 100,000 items! America's first Wax Museum invites you to experience over 150 figures from History to Hollywood! Take a picture with your favorite entertainer, introduce yourself to King Henry VIII and his wives, test your knowledge with the inventors, presidents and leaders of history. Potter's offers something for everyone. At the St Augustine History Museum, a combination of historical displays and private collections bring over 400 years of Florida history to life. Guests can visit the Spanish sunken treasure room, a Timucan Indian Village and a Florida Cracker trading post. This isn't your ordinary zoo! See some of the largest alligators and crocodiles in the world at the St. Augustine Alligator Farm. See MAXIMO a 15 foot, 1250 pound alligator or rare albino alligators. Welcome to St. Augustine's most inviting Historic Attraction: the Fountain of Youth Attraction. Explore what Archaeology tells us about this very important site. See the exhibits, hear the stories, taste the water and step into the past. Experience centuries of St. Augustine's rich history, brought to life at the Colonial Quarter-the revitalized two-acre signature attraction in the heart of downtown with living history demonstrations, graphical stories, dining, shopping and interactive activities, including climbing a 35-foot watchtower. Guides take you back in time to Military Hospital life you would have experienced had you been a patient during the Colonial Spanish period (1784-1821) in St. Augustine, Florida in the Spanish Military Hospital Museum. St. Augustine Pirate & Treasure Museum features the world's largest and most exclusive collection of authentic pirate artifacts dating back to the 16th century, award-winning interactive and educational exhibits; Disney-designed exhibits, and rarely-seen shipwreck treasures from the vault of the Florida Division of Historical Resources. Visit an architectural masterpiece built by Franklin Smith in 1883, and how it's construction literally changed the way St. Augustine would look forever. Explore an extensive art & antique collection including an ancient Egyptian rug over 2400 years old! Largest Medieval Torture Collection in the U.S. 4000 sq. ft. of torture devices, tools and depictions. Interactive and photo-friendly. This ticket includes admission to the World Golf Hall of Fame Museum and A Round on the 18-hole natural grass putting course. The museum houses interactive exhibits along with historic and personal artifacts which honor and celebrate golf's greatest players. Enjoy viewing magnificent bottlenose dolphins in their 1.3 million gallon habitat overlooking a pristine stretch of the Atlantic coastline. Learn about these amazing creatures from up close! St. Augustine's Original Sightseeing Cruise! In business for over 100 years, you will enjoy a scenic cruise of the beautiful waters of St. Augustine. Narrated tours provide an incomparable way to view St. Augustine's historical landmarks and natural sites of interest. Join an expert guide on a safe and fun boat tour into the rivers and creeks of St. Augustine, Florida. Great chance of seeing wild bottlenose dolphins, unique birdlife, and possibly even a manatee or sea turtle. Underwater microphones bring the river to life on these educational tours for a groups of 2 to 16 guests. All ages welcome! Get acquainted with the night, as licensed tour guides take you on a ghostly stroll of Old Town. Hear legends, lore's, and ghostly encounters from historical events and personal experiences. This tour is sure to make even extreme skeptics true believers of the paranormal. Savory Faire Food Walking Tour is the ORIGINAL St. Augustine 'foodie' adventure. Explore 2 1/2 hrs of delectable delights as you taste your way through St. Augustine's historic and cultural influences. Experience St. Augustine in a new light with this one of a kind tour that will plunge you into the local culture. Enjoy local history mixed with pub lore while embracing the ambiance of some of our quaint, charming local watering holes!